Autumn is the time to head to apple orchards, and most people in Omaha think of heading to Nebraska City to get their haul. 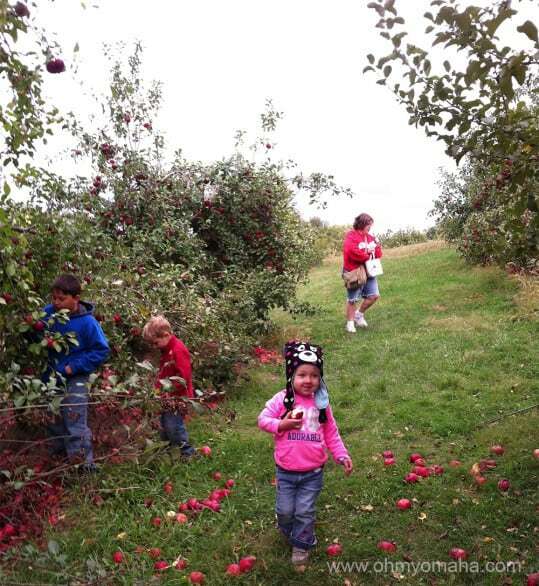 That’s a fun day trip, but there’s a spot closer to home to consider: Ditmar’s Apple Orchard. 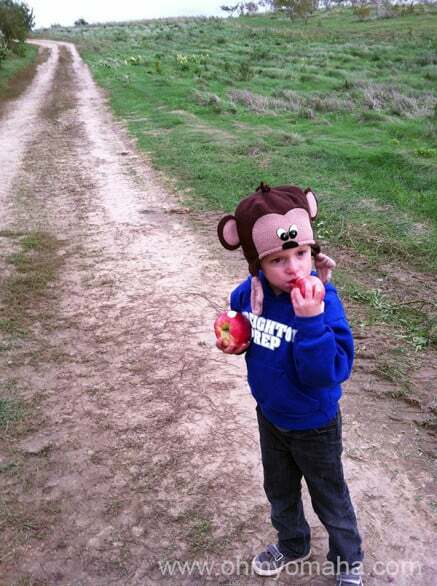 Farley loved getting to pull apples off trees. 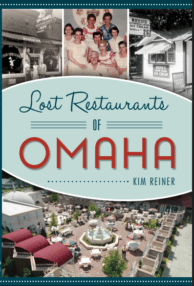 This orchard on the east side of Council Bluffs, Iowa, doesn’t have all the activities you’ll find at the biggest orchards in Nebraska City, but it also doesn’t have the jammed packed parking lots and herds of people. It has enough attractions to entertain your family for about two hours, maybe more on a nice day. If all you want from an apple orchard is a bunch of apples, don’t drive any further from home than you have to, right? Farley took the lead in the corn maze, mainly because Mooch was batting 0 for 8 on all guesses on the right path to take. Aunt Amy was a good sport trekking up and down the maze with us. 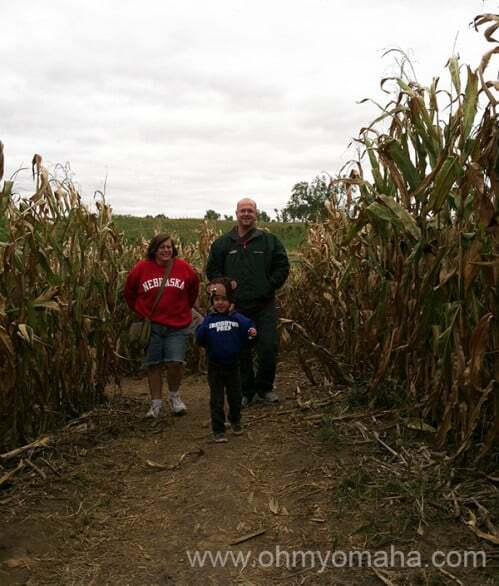 The corn maze – I was surprised that my kids got so into it, but my preschooler really enjoyed guessing which path to take. It’s a decent workout (especially hauling a toddler around), to boot. The food – The small shop has a kitchen where you can buy small treats and sandwich entrees (no meatless). The fried apple pie I’ve raved about was not on the chalkboard menu that day. But, I’ve found a new love because of that – fresh apple donuts. 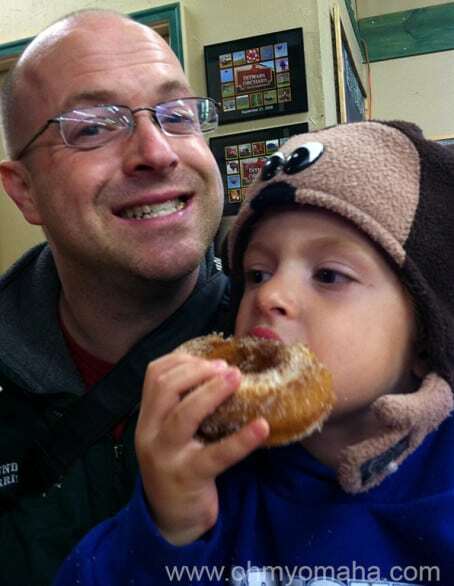 My family of four inhaled six apple donuts at Ditmar’s. I’ afraid to see what we would’ve done to a baker’s dozen. I’m not a huge fan of donuts, but these are warm, cakey treats that get devoured quickly. They also sell hot apple cider, and they offer wine tastings if you catch an employee near the bar (I believe the first three tastings are free). Chilling on the hayrack ride. Hayrack ride – My kids’ favorite part of the visit was probably the tractor pulling us up a big hill to get to the orchard. It’s included if you buy an activity band (more on that later). The tractor rides are only available on the weekends. 2013 was a good year for apples in Iowa, apparently. The trees at Ditmar’s were heavy with fruit. 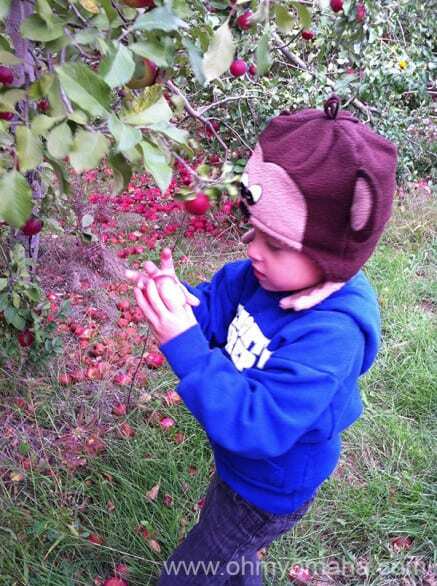 Apple picking – There are several varieties at the orchard to pick and take home (here’s a list http://www.ditmarsorchard.com/fruits.html). My family kept finding the honey crisps, which wouldn’t you know, cost extra (and apparently, we aren’t supposed to pick – there was a big to-do about it, there’s some sort of tape marking the trees off but most people didn’t notice it until after picking the trees and I didn’t pay attention to it at all). You’ve got to make sure you like the apples you take home, right? I feel the need to defend my little gluttons. My kids enjoyed sampling the apples before placing some in the bag. Is that a no no? 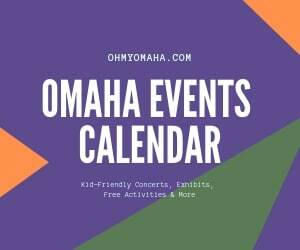 Tuesday/Wednesday: 10 a.m. to 6 p.m.
Sunday: 11 a.m. 6 p.m.
You’re supposed to have a wristband to do the kids’ stuff there – including the corn maze and hayrack ride I mentioned above. There is also a playground there (nothing special) and somewhere there is a corn sandbox, we never came across it. You can skip the corn maze and playground and still have a good time, but it’s worth getting the band for the hayrack ride if you have younger children, they love that stuff. The orchard begins not far from shop so you can just walk to the trees and begin picking. 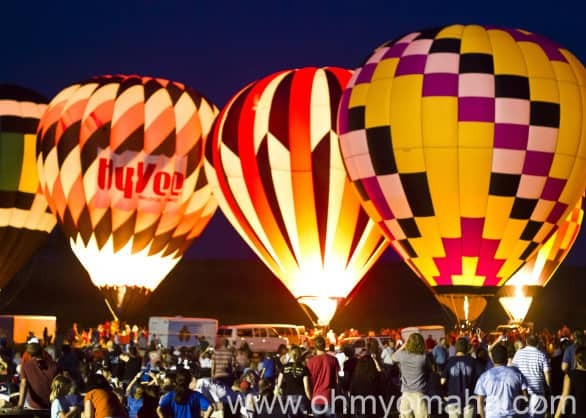 They hold events through out the year, including a very popular balloon glow. 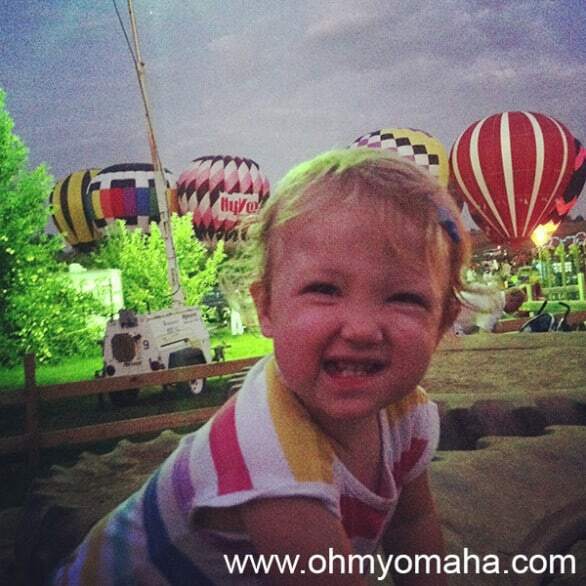 Mooch love playing on the tractor tire pile during the balloon glow at Ditmar’s this summer. Never has there been a filthier girl than my child upon leaving the orchard that night. Congrats, Mooch. We caught the tail end of it this year, it’s pretty neat. I don’t care how hip you are, when you see hot air balloons, you become as giddy as a school girl. Or a pyro. This weekend, Oct. 12 and 13, you can catch Pumpkin Fest with live music each day from 1 to 4 p.m.